• Uncontrolled period (1990 to present): subsidies to commercial hunters were removed making it not economical to "farm" wild reindeer. Harvest drastically reduced and population grew rapidly by 2000 to 1 million animals. Currently the herd is assumed to be declining although a population estimate has not been conducted since 2000. Through the population increase, the herd has progressively summered further east, using one of four centers of habitation within its 1.5 million km2 range. Protect small herds and restore wild reindeer in regions where numbers are low. Considerable pressure on wild reindeer environment is exerted by anthropogenic factors. The enterprises of "Norilsky Nickel" Company emit up to 2500 thousand tons of contaminant into the atmosphere which include sulfur dioxide gas, carbon monoxide and dioxide, nitric oxide and sulfuric acid aerosol. The influence of these substances causes herbaceous plants, shrubs and trees to dry up. 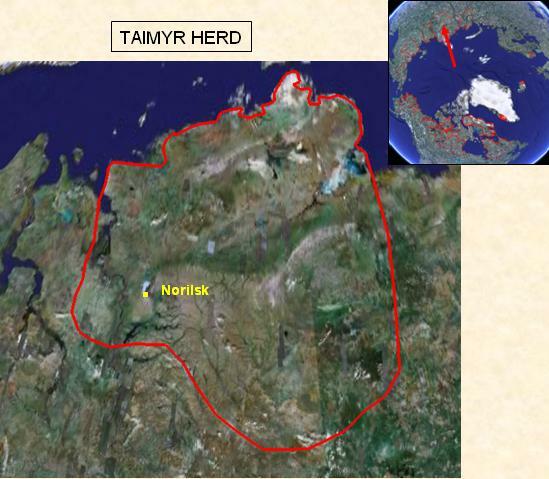 Lichen has disappeared from the Norilsk vicinity, and the area of dead forest in Taimyr amounts to 6000 km2. Within the distance of 110-120 km from the point of emission lichens have decreased by 18%. In the vicinity of the Hantai lake there are extensive zones where the levels of heavy metals in food plants and the meat of reindeer exceed the permissible maximum. According to the data given by the Taimyr Committee of Land Resources and Management, the combined effect of anthropogenic factors has led to vegetation degradation in the tundra and forest-tundra over the area of 20 km2. In recent years there has been a significant increase in poaching on the herd. For example in 2008 an estimated 80,000-100,000 animals were taken, five times the permissible limit. Klokov, Konstantin. 2004. Russia. In. Ulvevadet, B and Klokov, K Editors). Family-based reindeer herding and hunting economies, and the status and management of wild reindeer/caribou populations. Published by the Centre for Saami Studies, for Arctic Council 2004. p 55-94.